Chapters Indigo offers a lot more than just great books to read time and time again as they also have a wide selection of home items, toys and other nifty knickknacks. Give yourself a break on February 4th 2013 by taking a look at the clearance items in the toys, gifts and home decor items. For a limited time, you can also get a bonus 20% off these already reduced items. Don’t forget to stop by our Chapters Indigo coupon page for your code to save $5 off your order of $30 or more! Keep in mind that the added discount has already been added to the price shown! 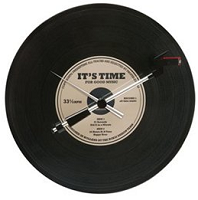 Isn’t it time that you picked up this Spinning record oldies clock? It’s retro groovy clock made from an old school record with a long hand that resembles a turntable arm with a needle cartridge. Originally priced at $110, this baby can rock on in your living room for only $44. Shop now to save on cute Halloween costumes for your toddler! Isn’t this Yoda costume for toddlers the cutest thing you have ever laid your eyes on? Dress your little one in it for as low as $15.66. What are you thinking of picking up?